Proof of monthly expenses, such as car payments, insurance, credit cards, etc. 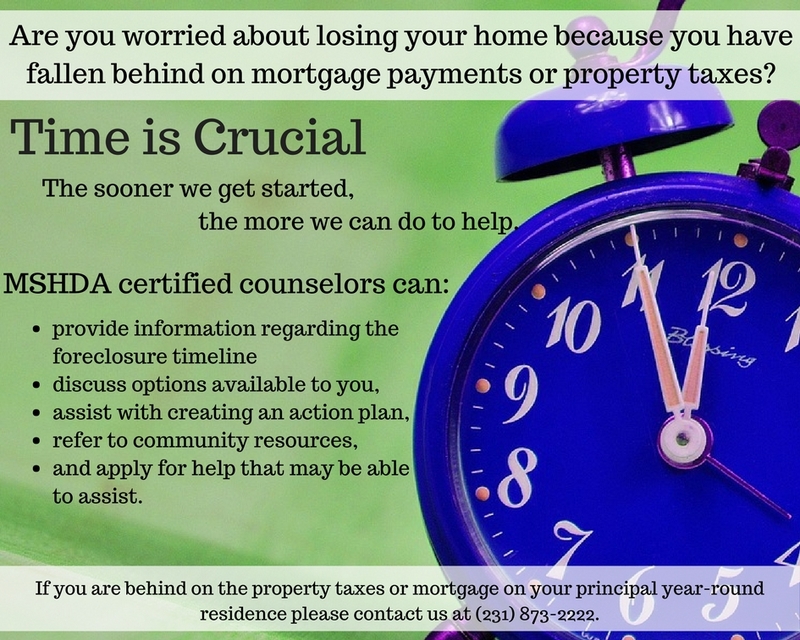 We recognize that foreclosure can be a daunting situation, we want to commend you for taking the first step in getting help. Application packets can be faxed (231) 873-2223, mailed, or dropped off in person at our office. Are you an Oceana County Homeowner? Are you looking to have repairs done to your home? There are programs may be able to assist! Weatherization assistance Program is a federally funded low-income residential energy conservation program. The program provides free home energy conservation services to Low-income homeowners and renter. VA offers monetary assistance to Veterans with specific service-connected physical disabilities so they can construct or modify a home to best meet your needs. Call the VA to have them mail the required claim form VA 26-4555. The Veteran Services offers minor home repair to qualified Veterans. Applications are approved once a month by the local board. Appointment for assistance must be made to determine eligibility for home repairs. Appointment for assistance must be made to determine eligibility for services.